The first pictures of puppies mothered by one of North Korea's "peace gift" dogs have been revealed by South Korea's president. Kim Jong-un, North Korea's leader, sent two dogs to his counterpart Moon Jae-in in a bid to promote peace on the Korean peninsula. One of the gifted dogs, a Pungsan hunting dog named Gomi, gave birth to three female and three male puppies earlier this month. The South Korean presidential office shared photos of the pups on social media, saying: "Here are Gomi's baby pups born on November 9. Mother pup and six babies are all very healthy." The Pungsan are said to be designated "national treasures" in North Korea according to reports. 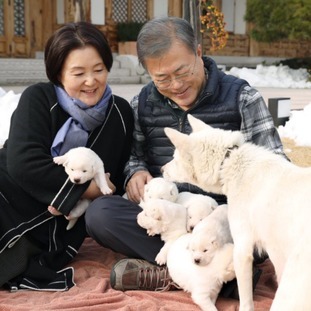 President Moon said on Twitter when the puppies where born: "As the pregnancy period of dogs is about two months, Gomi must have been pregnant when she came to us." He continued: "I hope inter-Korean ties will also be like this." The rare dog breed, which originates in a mountainous region of the North, is the most-prized dog breed in North Korea. It was bred to hunt tigers and other wild animals.